The Single Plane Academy Inner Circle has been UPDATED and GREATLY enhanced!!!! The Single Plane Academy Inner Circle now includes our entire library of content…this includes ALL of the DVDs we’ve produced over the years. Improve your full swing with Todd Graves, your short game with Tim Graves, PGA and enjoy exclusive Moe Norman archive footage. There’s always something new to discover with more content being added each week. We’ve made membership easy with two plans to choose. Just select the right plan for you. The New Silver Plan is your path to Single Plane Success. You’ll receive Total Access to the entire library of DVDs, monthly instructional Webinars, and Exclusive videos anywhere, anytime, on any device. 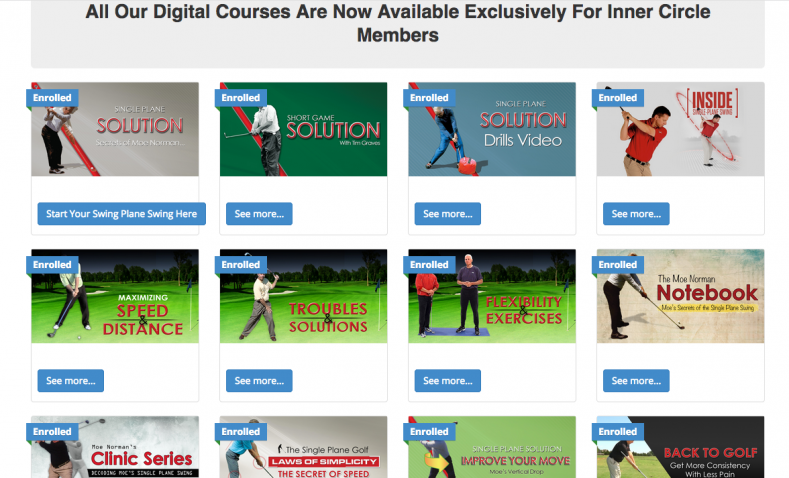 This is over 1,000 hours of instructional content at your hands anytime! Perhaps you desire more personal one-on-one instruction…our New Gold Plan is the one for you. In addition to the entire digital content of the Silver Plan, we are rolling out a brand new Concierge Service with Member’s Only phone line to call or text when you need help or have a question. Included with this service is the ability to receive a personal coaching video answer to your questions. Join Now and start lowering your scores! If you have any questions about either plans or anything else, please feel free to contact our specialist, Wes Wilkinson, PGA at 866-377-2316. If leave message, he will get back to you shortly.